A stunning backless dress with real elegance and flair. I totally fell in love with this dress in the shop, but we have decided to change the theme of the wedding so, with regret, I'm letting this lovely dress go. The fit and flare shape is super flattering and the integral bodice feels incredibly supportive and gives you an amazing figure! 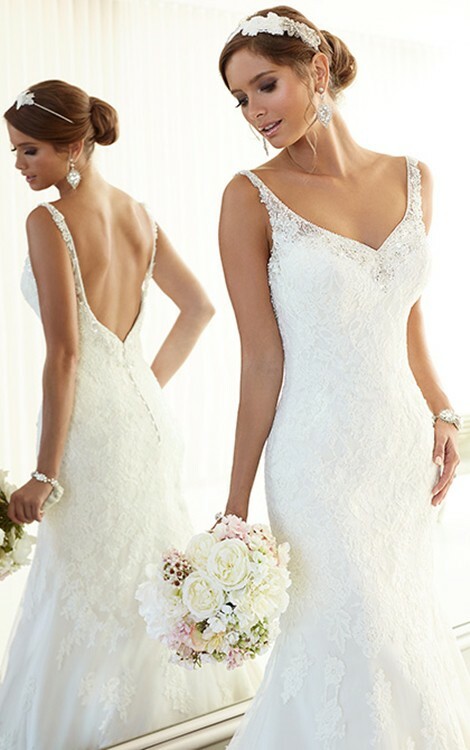 The lace is very pretty and there is some lovely subtle beading around the neckline which sets off the lace beautifully. The neckline is flatteringly low without being revealing and the back is finished with a line of crystal buttons. I am an average size 12 and it fitted like a glove. Unaltered shop sample in excellent condition. It has been dry cleaned and any minor wear and tear to the lace has been repaired (I could never see any anyway!). One layer of the netting under the skirt has been removed but could easily be put back. I also have a hoop bought for £50 which I would be willing to include in the sale by negotiation. The dress looks great without the hoop too. Feel free to message with any queries! Once you send a message, Rosamund can invite you to purchase the dress.